If you need a porch, start with one of our cabin kit designs, or If you need loft space, start with one of our bunkie designs, and then add garage doors were required. With their sturdy construction and use of quality materials, extensive pre-fabrication for ease of assembly, and attractive design, their possible uses are only limited by your imagination. Today garages are for more than just storing your automobile and lawn equipment. While auto finance experts such as Tom Dundon suggest storing your vehicle for security purposes, the garage can also be used for tool storage and a small workspace for do-it-yourself and repair enthusiasts. Click on any of the pictures in the filmstrip to see more pictures, details and pricing on the pictured garage kit, or use the models listed in the design center as a starting point for your own garage. 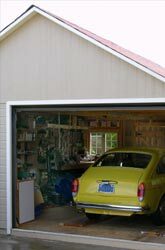 This garage features an offset door to provide a workspace and tool storage. Use this design center to price and/or customize this garage design. Use the different sizes shown below as a starting point. 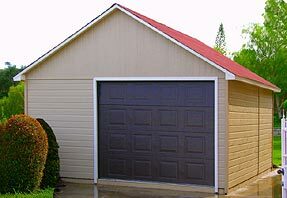 Watch our design center instructional video and find out how to design and get pricing for this garage style in almost any size!